Portrait of Benjamin Mountfort c.1890. Although not a member of the Armson Collins firm, Benjamin Woolfield Mountfort is represented in the Armson Collins Collection and was instrumental in the creation of a Gothic Revival townscape in Christchurch. C.R.H. Taylor described him as being “… a short man, of a most lovable and genial disposition, but essentially a student, a recluse; his one interest was architecture, with its associate studies of heraldry, history and art, in which he was completely wrapped." 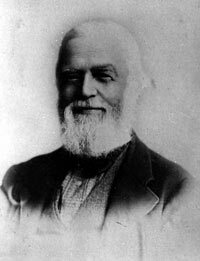 Born in 1825, Mountfort grew up in Birmingham, England, and in 1844 became an articled pupil with the architect Richard Carpenter of London. It is likely that Mountfort became a devotee of the Gothic style while completing his articles, as Carpenter was an influential Gothic Revival church architect. In 1850 Mountfort and his family arrived in Lyttelton on board the Charlotte Jane. He immediately began practicing as an architect, designing churches and taking on public commissions. In 1865 Mountfort designed the Canterbury Provincial Council Buildings in Christchurch, which are generally recognized as the outstanding achievement of his career, and the earliest example of High Victorian Gothic architecture in New Zealand. He also became a supervising architect for the Anglican Cathedral in Cathedral Square, and designed additions to the tower and spire. Mountfort demonstrated a strong commitment to personal and professional standards throughout his life. He was for example, one of the founding members of the Canterbury Association of Architects. He was also known as a devout and active member of the Anglican Church. A contemporary related the tale of Mountfort hurrying along to Canterbury College one day, intent on carrying out some study. As it was a Sunday however, Mountfort was holding his book and papers beneath his coat so as not to be seen breaking the Sabbath, and was horrified when the papers suddenly tumbled to the ground revealing his subterfuge to several passersby! Mountfort’s influence on the development of Canterbury College was significant. He not only designed a major Gothic building for Canterbury Museum, but was also responsible for the Canterbury College Clock Tower, East Wing, and the Great Hall. It would be difficult today to look at the cultural precinct around Rolleston Avenue and Worcester Boulevard in Christchurch without seeing Mountfort’s presence.